You've probably heard the tag line at some point in your life. And if you grew up in the U.S. and are over 35 and had a radio or TV, you certainly heard it used and paraphrased a lot in the 60s, 70s & 80s. "There are eight million stories in the Naked City, and this has been one of them." I heard it a lot and got to know it well. The phrase that is, but not the show it comes from. In 1945 a photographer known as "Weegee" put out a book of sensationalistic photos. He cruised the night life of New York City and captured in stark black and white the life and death of it's denizens. The book is still in print today. This tome of lurid images became the basis for the Film Noir classic with the same name as the book: THE NAKED CITY (1948). Shot in a semi documentary form, the film revolves around two cops trying to solve the case of a female fashion model murdered in her apartment. The opening narration to the film does not introduce the story itself but instead talks about how it was created. Eschewing Hollywood back lots and studios, it was filmed on the streets and in the apartment and office buildings of NYC itself. Thus defining the city as a part of the overarching character of the movie. This type of show-casing of the environment in a police drama was put to good use 30+ years later in The Streets of San Francisco. a Naked City publicity photo. Ten years after the movie came out, a spin off television series went into production. It used the same foundation of the streets of New York City as its true life backdrop. In its first season it was a half hour action show starring James Franciscus (Det. 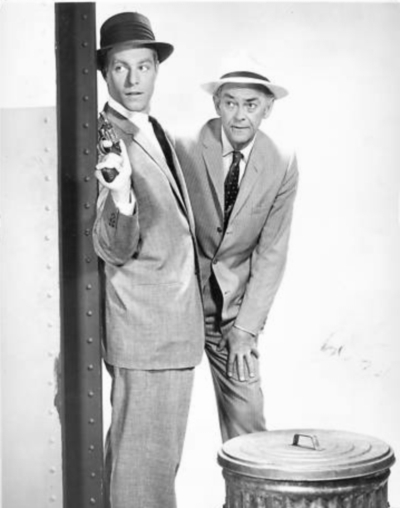 Halloran) and John McIntire (Lt. Muldoon). McIntire burned out on all the location shooting about halfway through the first season and when he left the show, his character was murdered in a flaming car crash, ran off the road by an assassin. Writer Stirling Silliphant had gone out of his way in the 30 minute opening season to engage in a lack of plot in order to get a concise, action packed story out and done with. It was full of shootouts and tense situations with vignettes of personal pathos. There was some focus on the criminals themselves, hinting at what was to come later. Though full of terse action and drama, it failed to garner high ratings and at the end of the season it went on hiatus for a year. 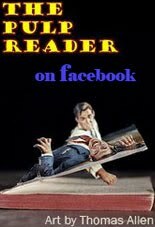 When it returned in 1960 it had been retooled into an hour long show focusing less on action and more on drama with a new lead; the unconceitedly charismatic Paul Burke as "Det. Flint". 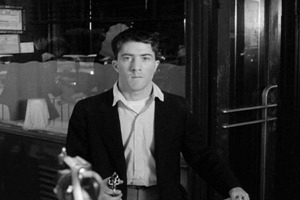 What really began to stand out with NAKED CITY as different from other crime dramas was this greater focus on the criminals. Almost all of the shows spend more air-time looking at the lives of the criminals than on the police procedural itself. The criminals in this show turned out to be humans. Not just brief character sketches to push the plot along. Some are normal people thrown into unfortunate circumstances that force them into crime, some are born bad and show it through and through. Others straddle the fence, some eventually falling on the side of the law but usually on the side of villainy. There was still plenty of violence though. I imagine there must have been a directive from the studio execs requiring a certain amount of violence in each episode. There was a lot of shoot 'em up in almost every episode. The only episode I've seen so far that did not have some type of explosive amount of lead poisoning is the Dennis Hopper starring episode "Shoes for Vinnie Winford", which though it has a car chase, does not have any gunplay. in "The Fault of Our Stars"
Though this interesting and different angle of centering on the criminal elements made it unique, what made it shine was the writing. Every episode I've seen so far has been perfectly written. There is always a balance between drama, horror and comedy. Comedy? Yes, there tends to be a lot of funny and cute moments amidst the turmoil. The dialog especially for the heroes tends to be very witty and charming. Something that with the modern focus on verity method acting and method writing seems to have all but disappeared from television and movies. Too bad, I say, as contemporary entertainment could use a lot more charm and wit. 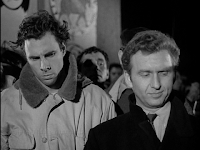 Some episodes are very funny throughout (The Virtues of Madame Douvay), some are heart-warming journeys to redemption (Debt of Honor), and others deal with irredeemable and uncompromising evil (A Death of Princes). Each story whether being about horror, action, love, comedy or equilibrium, they have, in my opinion, all been successful. "Barefoot on a Bed of Coals"
Another interesting thing about this show is the staggering amount of up coming actors who guest-starred in the series who went on to very successful careers. Forgive me for cribbing from wikipedia, but here is a small list of actors seen on NAKED CITY; Rip Torn, Tuesday Weld, Jack Klugman, Peter Falk, Robert Duvall, Carroll O'Connor, Jean Stapleton, Suzanne Pleshette, George Segal, Martin Sheen, Robert Redford, Sylvia Miles, Jon Voight, Sandy Dennis, William Shatner, Christopher Walken and Dustin Hoffman. 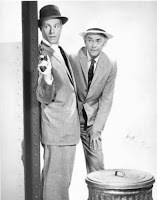 The show also featured such established performers as Kim Hunter, Eileen Heckart, Nehemiah Persoff, Betty Field, Luther Adler, Geraldine Fitzgerald, Jan Sterling, Mildred Natwick, Walter Matthau, Viveca Lindfors, Claude Rains, Jack Warden, Eli Wallach, Burgess Meredith, Mickey Rooney, and Aldo Ray. Well, at the beginning of this post I mentioned not actually seeing the show. That is until recently. Retro Television Network started rerunning the series in July. RTV shows the half-hour episodes on the weekend and the hour shows during the week. Watching it on RTV got me hooked and am very happy about the discovery of this television relic. It may be over 50 years old now, but the writing, acting and overall production still have a moxie and life that makes it very entertaining and engaging today. If you do not have RTV, there were 3 box sets of the "best of" episodes put out by Image Entertainment. They are out of print but easily findable at online retail outlets and on Netflix.